Way back in the 4th century in the city of Antioch there lived a woman named Pelagia. [i] Pelagia was the most famous actress of that city with many admirers. A dancer, often appearing in theater performances, she lived a life of frivolity and prostitution. So great was her beauty, that no one ever stopped speaking of it. One day, the holy bishop Nonnus was with his fellow bishops, when seen riding by on the street was Pelagia. She was dressed in a provocative manner; dressed up in pearls and precious jewels; even her bare feet were covered with gold and pearls. Along with her was a crowd of boy and girl admirers following her and laughing. As she and her entourage passed by, the sound of music and the smell of perfume filled the air. Bishop Nonnus turned to his fellow bishops and said, ‘brothers, how many hours a day does this woman spend on making herself beautiful to please her admirers, and yet Christians spend such a small amount of time and effort to make their soul pleasing to Christ Jesus – Jesus, who is the great lover of souls. She promises to please her lovers, but we have promised to please God. Later that day, Nonnus knelt and prayed with all his might for Pelagia; he prayed so hard that his deacon was afraid and ran away. When Sunday arrived, the Nonnus spoke a homily at Holy Mass about the Last Judgment, and the need to seek God’s mercy. Now it happened that the Lord had guided to that Church, none other than Pelagia, the Actress. Never before had she entered the house of God and never before had she even thought of her sins; but suddenly her heart was pierced with God’s love. ‘But, he said, it is written that a harlot may not be baptized without sponsors, who will guarantee that you will not return to your former way of life. But again her tears poured onto the feet of Nonnus: ‘To you I will confess all the sins I have committed, she said. ‘You must give me rebirth, and make me a bride of Jesus Christ. Then all the people there were amazed and said that they had never before seen such faith and such desire for salvation, as in this harlot. Pelagia DID change her life; all the jewels and wealth that she had acquired by her sinful ways she gave to the poor; she was baptized. Friends, we begin Lent today. We ourselves are called to turn away from our sins and to begin anew – to be born again. Lent is not just about putting ashes on our head, it’s about changing our life; no matter how hard it may be to tear ourselves away from the slavery of sin, whether it be a sinful habit, an evil relationship, or whatever – it is time to do some painful surgery to our soul. Part of this surgery to cut out the infection, is going to Confession. St. Paul says today, ‘Be reconciled to God.’ So, every single person here, over the age of 7 needs to go to confession during Lent. We all have sins to confess: taking things that are not ours, gluttony, lies, sexual sins, perverting marital love, gossip, hatred, skipping Sunday Mass, laziness, missing daily prayers, wasting our life on tv or internet or games, avoiding our duties, greediness, lack of ambition – we need to change our life. In so many ways we are like Pelagia. You may say ‘No, I’m not as bad as she was, I’m no harlot! Really? Who’s really more guilty? When she was a sinner, Pelagia did not know Jesus, she was ignorant. But we are already baptized Christians, so we are without excuse! 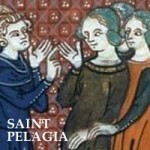 [ii] And Pelagia repented, she changed her life and became a saint – yes: St. Pelagia. 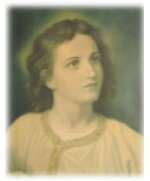 She is honored as a saint by the Holy Catholic Church. So what about us? God wants us to become saints, to be totally in: not partially, totally. How long will God have to wait for us? Let’s confess our sins this Lent, and begin new. The God who forgives us, is the same God who wants to make us saints. [i] the whole story of Pelagia is found in ‘Harlots of the Desert’ by Benedicta Ward.